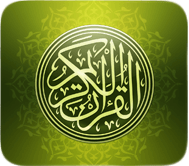 A Mobile version of this Website designed using HTML5/CSS is also available for Mobile devices like Android, iPhone, BlackBerry or Tablet PC at www.quran4mobile.com. القرآن الكريم : The Noble Quran (The Holy Quran, Quran kareem, Qur'an, Kuran, Koran, Qur'a-n, Coran or al-Qur'a-n) is a Message from Allah (swt) to humanity. It was transmitted to us in a chain starting from the Almighty Himself (swt) to the angel Gabriel to the Prophet Muhammad (saw). This message was given to the Prophet (saw) in pieces over a period spanning approximately 23 years (610 CE to 632 CE). The Prophet (saw) was 40 years old when the Quran began to be revealed to him, and he was 63 when the revelation was completed. The language of the original message was Arabic, but it has been translated into many other languages. The Quran is one of the two sources which form the basis of Islam. The second source is the Sunnah of the Prophet (saw). What makes the Quran different from the Sunnah is primarily its form. Unlike the Sunnah, the Quran is literally the Word of Allah (swt), whereas the Sunnah was inspired by Allah but the wording and actions are the Prophet's (saw). The Quran has not been expressed using any human's words. Its wording is letter for letter fixed by no one but Allah. Prophet Muhammad (saw) was the final Messenger of Allah to humanity, and therefore the Quran is the last Message which Allah (swt) has sent to us. Its predecessors such as the Torah, Psalms, and Gospels have all been superseded. It is an obligation - and blessing - for all who hear of the Quran and Islam to investigate it and evaluate it for themselves. Allah (swt) has guaranteed that He will protect the Quran from human tampering, and today's readers can find exact copies of it all over the world. The Quran of today is the same as the Quran revealed to Muhammad (saw) 1400 years ago.